On September 1st, the original "Charcoal" Air Jordan VII was re-released. Back in 2002, the shoe was retroed for the first time and that is when the unfortunate nickname of the "Raptors" came into play. The "Raptor" nickname came about because this colorway which features black, red and purple match the team colors of the Toronto Raptors. 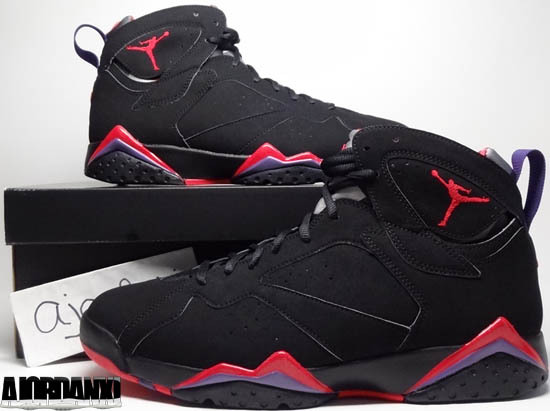 Even though the Raptors did exist until 1995 (three years after the Air Jordan VII was originally released), people still refer to this colorway as the "Raptors" to this day. First retroed in 2002, it took ten years for Jordan Brand to re-retro them. As you can see from the pictures below, I have both versions. In comparison, the 2012 release is pretty on point. While many have questioned the shape and quality of recent retros, the 2012 Air Jordan 7 Retro black, true red, dark charcoal and club purple colorway was done pretty well. Enjoy the images below and, you can check out both in the Air Jordan VII section of My Collection. If you're looking for either release, grab a pair from eBay here.